By donating to International Overdose Awareness Day you can help us spread the message that the tragedy of overdose is preventable. Your support is extremely valuable. Every dollar counts in helping us create awareness about overdose prevention as well as providing support to people who have lost loved ones to overdose. People lost due to overdose are not just statistics – they are family members and friends. International Overdose Awareness Day is an initiative of Penington Institute. 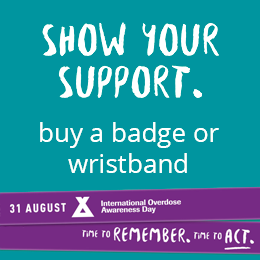 Through International Overdose Awareness Day, we drive an overdose awareness campaign that includes community education and awareness-raising activities. Donating to International Overdose Awareness Day will help us to confront stigma and raise awareness about drug overdose. For your convenience you can pay via direct bank transfer, online or mail a cheque. Please make your cheque payable to Penington Institute. Don’t forget to enclose details of your full name, telephone number and postal address. For further information on donations, sponsorship, events, gifts in-kind, pro-bono assistance and bequests please email info@overdoseday.com.